Dear all – I’ve sent out mails and postings about Karachi Relief Trust before – but thought this personal note was worth sending out again. 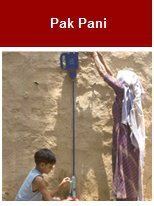 One of their most important initiatives is the water purifier units (Pak Pani) they are supplying which may save thousands of lives. Please do take a minute to read it and do what you can. Every little bit counts. I know you will find this email long but please read it and donate. Every little helps!! Join the Turn the Tide facebook page, and the KRT facebook page. Also, please see the KRT website at the end. It includes material on an earlier Turn the Tide fundraising drive for Internally Displaced People and will assure you that your donations are reaching those who need it the most. There is a video as well about the previous work. In the recent past natural disasters have not been uncommon but the floods in Pakistan, which have inundated one fifth of the country and displaced 20 million people, appear to surpass them all. According to the UN Office for the Coordination of Humanitarian Affairs the number of people affected is higher than the Haiti earthquake, the Indian Ocean tsunami and Kashmir earthquake combined. This country needs your help. The need of the hour is food, water, medication, clothing and shelter. As a first step in channeling relief efforts we have decided to focus our aid and endeavours towards ‘drinking water’ in conjunction with a private trust called Karachi Relief Trust (KRT) (www.karachirelieftrust.org) which is doing an admirable job in organising relief efforts across Pakistan in multiple areas. We are procuring a water purifying apparatus as there is acute shortage of drinking water and deadly water borne diseases (in particular cholera) are fast emerging as potentially the most serious threat to millions. For provision of drinking water KRT has already imported limited quantities of a product called Life Straw Family, a water purification apparatus designed for use in disaster zones. It uses no power or spare parts, costs $25 plus duties, and cleanses 18,000 liters of contaminated water. KRT is trying to obtain exemption from the duties. You may visit Lifestraw-Family for information on this product. We have worked out an arrangement with KRT which ensures transparency and is logistically effective. KRT has agreed to import the product for us with donations received from you. To ensure your money is tracked and accounted for KRT has opened a separate bank account dedicated for money donated by you (Dedicated Account). All monies received in the Dedicated Account will be used to provide relief to the victims (note: administrative and operational costs pertaining to the relief, including but not limited to transportation and distribution costs thereof will be borne by KRT and us). Once procured my friends will personally transport relief goods to the affected areas through logistics networks of KRT, which has penetrated many flood hit areas and is running various camps for the displaced. They will distribute the product amongst the flood victims and train them on how to use the product. I commit to report back to you with details of the relief efforts and account for exactly how your donations were utilised. Besides donating may I request you to widely circulate this e-mail amongst family and friends, and encourage them to do the same. While our efforts will woefully fall short of the dire needs of the 20 million victims, we nonetheless think it necessary to act. Donors from USA may also transfer funds using their debit/credit card (Visa/Mastercard) through United Bank Limited’s ‘ClickNRemit’ facility. Please read the FAQ section before using. Please notify any donations made to the Dedicated Account at mehrunnisa.yusuf@gmail.com so we can ensure receipt of the same. Do get in touch with me on if you have any queries!